A Beddgelert man was roared on to victory as he took advantage of perfect weather conditions to win the 34th Snowdonia marathon. 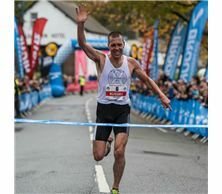 Russell Bentley, who relocated to Beddgelert from Kent, recorded an impressive time of 2:35:05 seeing off nearest rival Daniel Jones on 2:36:48. Bentley showed his supremacy in the early miles setting a steady pace on the climb to Pen Y Pass establishing a lead of 40 seconds. Despite pressure from Jones and third placed Rob Bridges in the middle stages, 35 year-old Bentley held his nerve to be the first to cross the finish line and collect the Snowdonia marathon Eryri trophy. Joanne Nelson was first place for the women clocking a time of 3:03:59 for Darwen Dashers RC. Nelson showed her fluidity and strength at mile 24 as she stretched her lead to more than one minute as the finish on Llanberis High Street approached. Racing to the win in a superb new course record of 3:03:59, Nelson was ecstatic as the realisation of her achievement became reality. Race organiser Jayne Lloyd thanked all those involved as she looked forward to next year’s event. 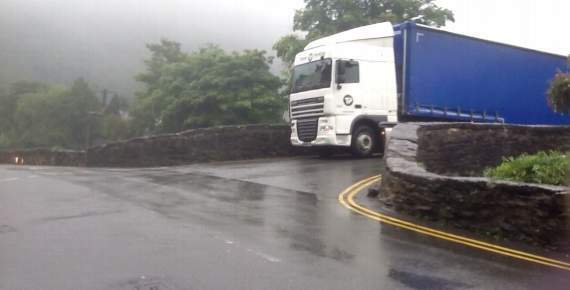 Calls are being made for mandatory signs to be put in place to stop lorries from entering Beddgelert after one was reversed into a shop. For a number of years, residents and businesses have been plagued by large lorries which have been driving through the village and damaging the bridge and properties. Signs have been placed on the route to the village near Tremadog advising motorists not to follow sat-nav systems down unsuitable roads, but calls are now being made for these signs to be made mandatory after two more lorries become stuck in the village in the same week. The Royal Goat Hotel in Beddgelert has been sold for £875,000. A famous Beddgelert hotel – where the legend of Prince Llywelyn and his faithful hound Gelert was sold to the world – has been bought. The Royal Goat Hotel – whose guests have included Ingrid Bergman – was originally built as the Beddgelert Hotel in 1802 by Thomas Jones, whose wife had inherited the Beddgelert estate. It was conceived to cater for the increasing numbers of tourists visiting Snowdon and was the birthplace of a marketing masterstroke by the first tenant manager David Pritchard. He promoted the story of Gelert, the loyal hound mistakenly slain by his master Prince Llywelyn and created a monument known as Gelert’s Grave in a nearby field in an attempt to further boost tourism. It worked, as the legend became a talking point in Victorian homes and to this day thousands of people visit Gelert’s grave. The hotel became the Royal Goat in the 1870s to commemorate a visit by Prince Arthur, Duke of Connaught. Other famous guests who have stayed at the hotel include Casablanca star Ingrid Bergman, while filming The Inn of the Sixth Happiness. 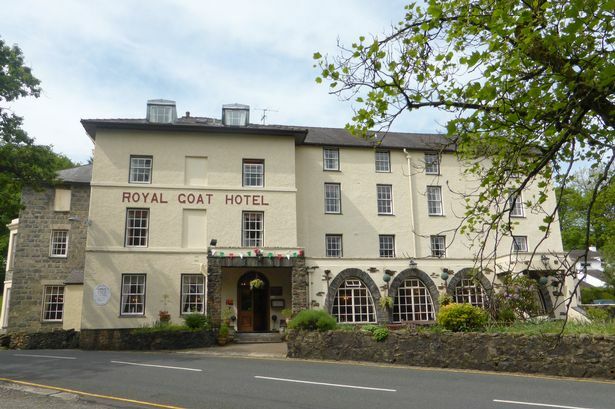 Real estate advisors Colliers International completed the sale of the Royal Goat Hotel to Parkfield Snowdonia Ltd.
Acting on behalf of previous owners Ben and Vicky Doodson, who have sold the business to concentrate on a recently launched restaurant venture in Abersoch, Colliers secured the sale from an asking price of £875,000. The new owners are David and Michelle Cattrall, directors of Parkfield Snowdonia, who operate the recently refurbished Saracens Head pub restaurant with accommodation in Beddgelert, and plan to invest in the hotel. The hotel has 33 en suite bedrooms, two residents’ lounges, a public bar and two restaurants. A hotelier was banned from driving after he admitted using a mobile phone at the wheel. Ben Doodson, a director of the Royal Goat Hotel in Beddgelert, was disqualified for six months after he accumulated 12 penalty points. Magistrates at Pwllheli heard the 37-year-old already had two speeding tickets and another driving offence on his licence when he was stopped at Tremadog last September. The court heard he was seen by officers holding the phone to his left ear while driving through the village. Doodson, who lives at Tan y Gaer, Abersoch, argued a driving ban would cause hardship for himself, his family and the business. His solicitor Richard Williams said he worked long hours and would not be in a position to employ someone else to undertake his duties at the hotel. He added it was financially not possible to employ someone to drive either. Bench chairman Gareth Haulfryn Williams said they had considered everything that had been said but they had concluded it did not amount to exceptional hardship. “It may amount to exceptional inconvenience but we do not consider it to be exceptional hardship,” he said. Doodson was also fined £60 and ordered to pay a £15 victim surcharge. Mr Hywel Griffiths, aged 35, a son of Mr Richard Griffiths, of Carneddi Farm, Beddgelert, was yesterday found drowned in Dinas Lake, about two miles from his home. The inquest will be held today. Note: Deceased was Hywel Wyn Griffith, 42, a farmer, born 31 May 1903, died 3 August 1945. Carneddi Farm is in the hamlet of Nantmor. Two applicants were placed on the military register by the North Wales Conscientious Objectors’ Tribunal at Caernarvon yesterday. They were Gwilym Thomas Evans, Penlon, Rhosgadfan, and Henry E. Hughes, Bron Hebog Farm, Beddgelert. Hughes said he was farming 200 acres at Beddgelert. Owing to a misapprehension he had registered himself as a stone-waller, but in fact he was only engaged occasionally as a waller. It was pointed out to Hughes that if he had registrered correctly he would have been in a reserved occupation and would not have been called for military service. The Rev. G. B. Walmsley, curate of Llandudno, and formerly curate of Menai Bridge, has been appointed vicar of Beddgelert, in succession to the late Rev. John Jenkins. The Rev. G. B. Walmsley, who is a native of Four Crosses, near Pwllheli, is a graduate of Leeds University. The Rev. 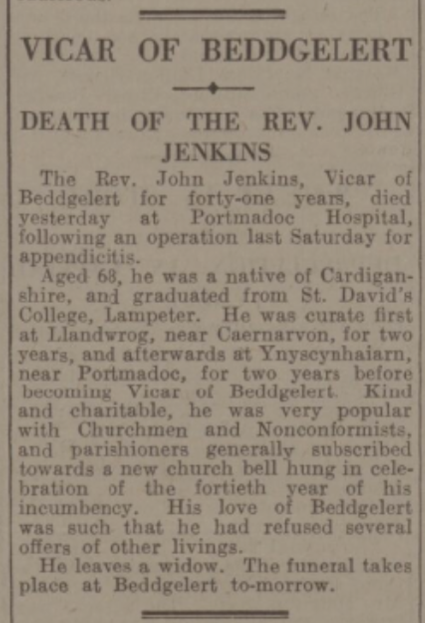 John Jenkins, Vicar of Beddgelert for forty-one years, died yesterday at Portmadoc Hospital, following an operation last Saturday for appendicitis. Aged 68, he was a native of Cardiganshire, and graduated from St. David’s College, Lampeter. 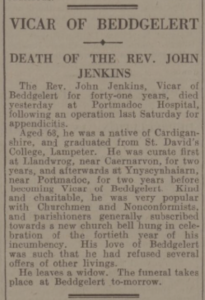 He was curate first at Llandwrog, near Caernarvon, for two years, and afterwards at Ynyscynhaiarn, near Portmadoc, for two years before coming Vicar of Beddgelert. Kind and charitable, he was very popular with Churchmen and Nonconformists, and parishioners generally subscribed towards a new church bell hung in celebration of the fortieth year of his incumbency. His love of Beddgelert was such that he had refused several offers of other livings. He leaves a widow. The funeral takes place at Beddgelert to-morrow.